Today, many around the world are celebrating Barbie’s Birthday. Did you know Barbie was introduced on March 9, 1959 at the New York Toy Fair? She sold for $3. 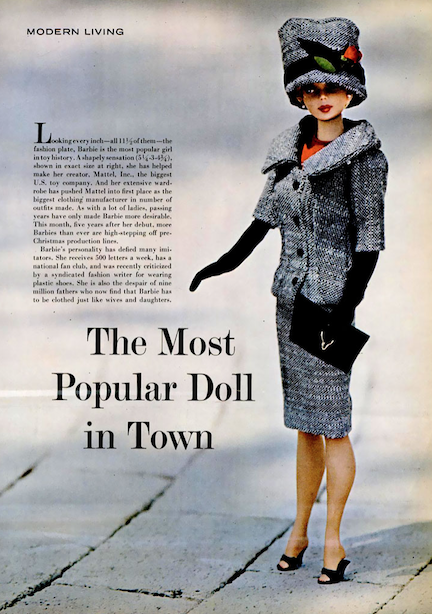 In 1963, Life Magazine declared five-year-old Barbie – The Most Popular Doll in Town. I was born that year into the Barbie Generation – those of us who never knew life Before Barbie. Barbie has become both a cultural icon and a celebrity. Her handprints and footprints are stamped in cement at Grauman’s Chinese Theatre and she is often in the news. Do you remember your first Barbie doll? Most of us have a Barbie Story. Some have a lifetime love affair with her and others scorn her. She has starred in movies, had a hit song written about her (take a moment to sing along – “I’m a Barbie girl, in a Barbie world. Life is plastic it’s fantastic…”) and she’s been wrapped in a tortilla to become “Burrito Barbie” in the Food Chain Barbie art exhibit. Everyone knows that her signature color is pink – but did you know that her particular color of pink (Pantone 219 C) is trademarked? Barbie is a doll with a past. She was modeled after Lilli – a scantily clad German doll of ill repute, but she cleaned up nicely to become the all American girl. Her first career was as a Teenage Fashion Model, and she went on to have more than a hundred careers including everything from police officer to paleontologist, astronaut to Miss America, See’s Candy seller to Sea World trainer and many more. 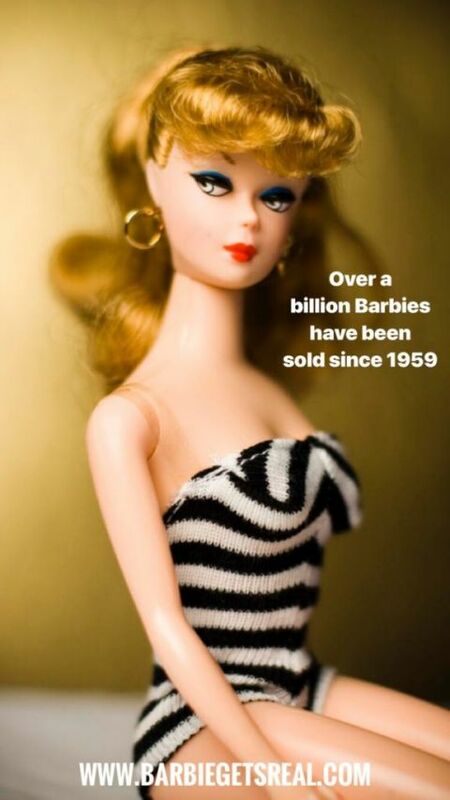 At sixty-years-old, Barbie is one of the most popular toys ever – with over a billion Barbie dolls sold. As a child, I spent hours playing with my Barbie dolls. They led very glamorous lives— wearing miniature versions of the latest fashions that were all stored in my pink vinyl cases—along with hundreds of accessories, including Ken, the boyfriend. In full disclosure, I will state that when my Malibu Barbie went to the beach — it was GI Joe that applied her Coppertone Suntan Lotion. After growing up in Barbie’s shapely shadow, I followed in her tiny footsteps and became a teenage fashion model. After my foray into The Ugly Business of Beautiful Women – I really did have more issues than Vogue. After I quit working in the fashion industry, I looked back over my life and began to analyze what factors had warped my idea of beauty. For years, I had a soapbox, traveled the US, and spoke about Body Image. I had a few Barbie dolls that went with me. During my speeches, I would hold them up and say, “I believe these dolls set a standard for perfection that is unattainable for any human and gives your young daughters the wrong idea about beauty.” I discouraged women from buying Barbies because of her lack of a thigh gap and her unrealistic figure. I used Barbie’s tiny pink scale that was set at 110 pounds and her miniature book titled, “How to Lose Weight, and offered the dieting advice, “Don’t Eat!” as visual exhibits of the problem. 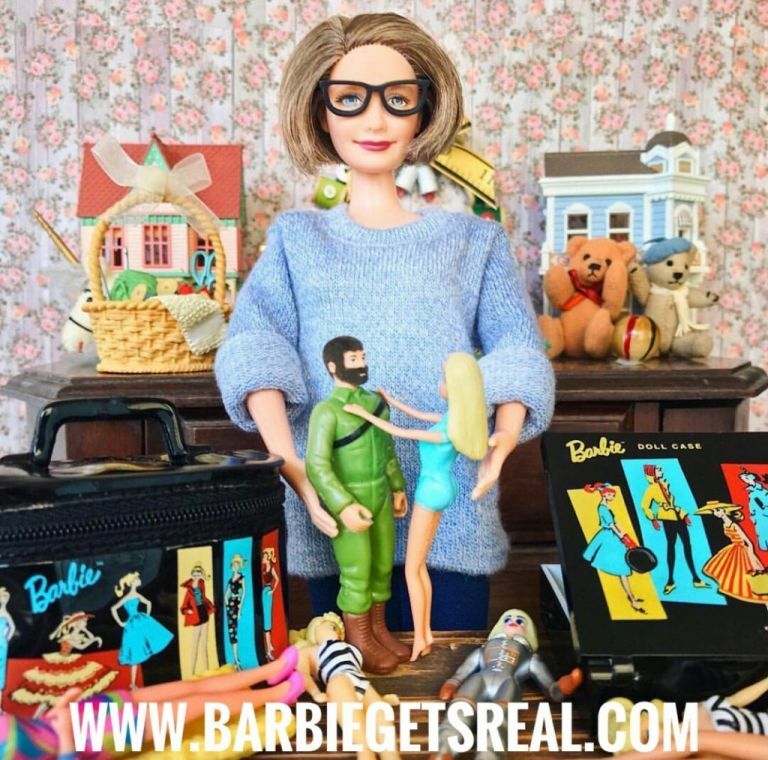 Decades later, I can say that I believe that Barbie is an echo of a culture that judged women on the size of their waist, the condition of their skin, and their reflection in a mirror. I can’t exclusively blame Barbie and burn her Salem-witchcraft-style without equally condemning the fashion industry. Plastic perfection was not only on a doll – but portrayed in the airbrushed images we consumed in fashion magazines. I told the girls. “I’ve seen in the news that Mattel has made Barbies that look more like real people. Let’s go shopping and see what we can find.” As we looked for new dolls, I was extremely happy to find choices of Barbies with various skin-tones, hair colors, and body types. Sometimes in life, there are second chances. Barbie is getting a second chance at my house. Mattel’s new Barbies are a better reflection of what my grandchildren see when they are in a crowd. We decided to try and find a doll to represent each person in our family. Our Barbie search turned into a plastic version of Finding Your Roots and we now have dolls to represent all 19 members of our family – included me, Grandma Barbie. 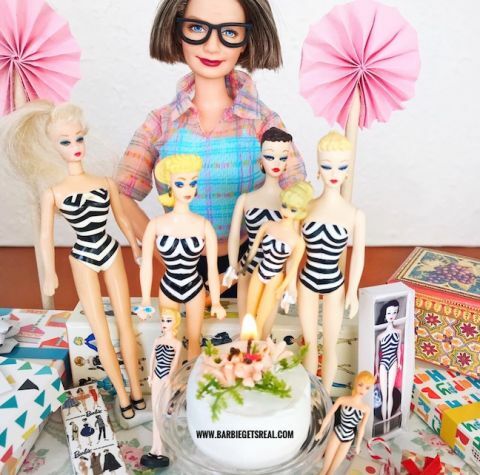 I have a popular Instagram account that depicts a one sixth scale parallel Barbie universe. I have come full circle. As Barbie is celebrating her 60th Birthday this week, along with many from the Barbie Generation, I am celebrating her.